After the last batch of homes, nothing much has come up on the market, so I did some research on the Crest home to see if that is feasible. I got a quote to fill the basement for 25K. Not cheap, but less than the 50-75k i was thinking. I got some quotes on insurance which were expensive, but showed I'd save 2K a year once the basement is filled. Since we have nothing else to see, we schedule a return trip to the Crest bungalow. On second visit, the house loses some of its original shine. I think I learned 2 things from looking at houses for the year: 1. Don't trust the pictures on the site. You need to see the house in person. 2. Second visits can bring you back to reality. You may get enamored by some feature like a staircase on first visit and tune out the rest of the visit. But on second visit, you'll start noticing the signs of water damage or skewed floors. On the return visit, the first problem is that someone is doing some shoddy work to try and spruce the place up. In the entryway, they ripped down the wallpaper and painted the walls yellow, but it's poorly done with drips on the molding and smoke alarms. They also laid down cheap carpeting to cover the worn wooden floors, but I'd rather have worn wooden floors than cheap carpeting. 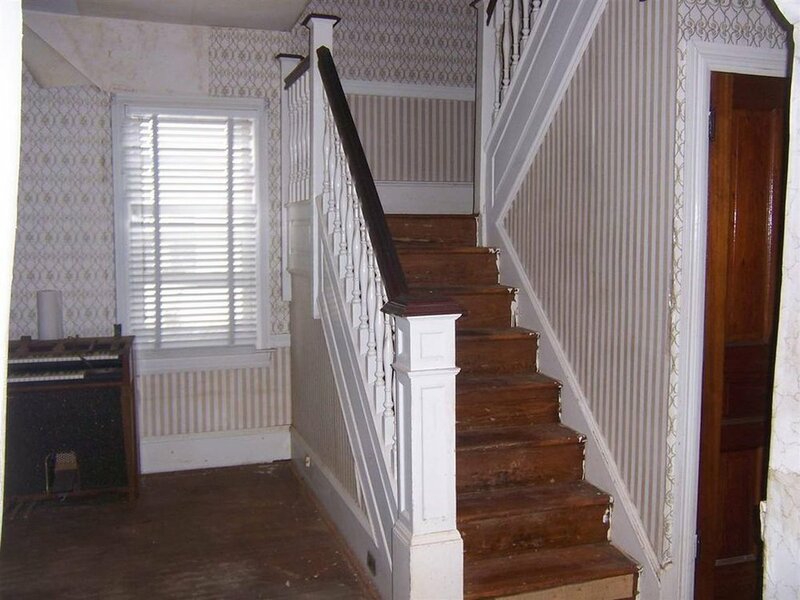 Also the joining between the entry room and dining room is the worst I've ever seen. I can't imagine what anyone is thinking when they do something like this. I would think you'd have 2 buyers for this house - 1. A wacko like me who's into old homes. In that case, keep all the original stuff you can. 2. Would be a Crest buyer who wants to gut the place and replace standard upscale things like granite counters and stainless steel appliances. In either case I can't see who the changes are going to fool. Original version with wood floors, peeling wallpaper and badass organ. Updates removed the organ, added Home Depot carpet, and yellow paint to replace wallpaper. I know the wallpaper needed to be removed, but it looked so much cooler than the yellow paint. Outside of the crappy renovations, the house has a lot of water stains which could be problem with leaks and/or mold. Also the house has a weird layout where it's not like a true bungalow with open layout or open porch. It's a bungalow with traditional blocked off layout and a closed in porch. Trying to find space for the mechanicals or a 2nd bathroom looks like a big challenge where I may need to build a structure outside the house. Bedroom has lots of cool old furniture (not included in the sale), but on closer inspection noticed lots of water stains in ceiling and around windows. Before the 2nd visit, I was leaning towards an offer on the place, but after another look I realized it would not be a wise move. The Crest already puts a premium on the price so I'd be paying 50% more than I'd be paying in Wildwood and since the house was in rough condition, I'd rather save the tens of thousands of cash and go for a house in better shape in Wildwood.